This multi coloured unusual looking building is a residential building complex in Darmstadt, Germany. Known as "Waldspirale" meaning 'forest spiral' the name reflects both the general plan of the building and the fact that it has a green roof. 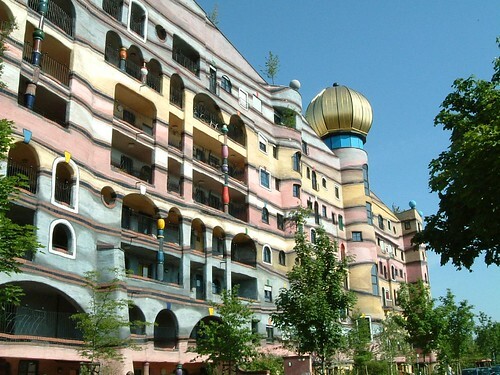 It was designed by Viennese artist Friedensreich Hundertwasser, and was completed in 2000. It is reported that the Architect Hundertwasser drew the original design on a napkin while eating dinner with his client. The basic design did not change significantly from this original concept. The architect died a few months before the building was completed. The Waldspirale apartment building contains 105 apartments. Peculiarities of the U-shaped building are the unique facade, which has no straight lines and does not follow a regular grid organization, and the windows which number over 1000, are all unique: no two windows are the same. Similarly, different handles are attached in each apartment to the doors and windows. Natural features of the landscape are expressed in this building: the layers of sedimental rock found underneath the site are reflected on the facade in bands of ceramic tiles and coloured stucco. The roof of the altogether 12 floors is formed by a garden of beech, maple, and lime trees. Spiralling ramps on the roof and around the perimeter make all floors in the building accessible without stairways or elevators.